The statistic shows data on the revenue generated by Pandora Media, Inc. in the fiscal periods between February 2006 to December 2017. In the fiscal year ending in December 2016, Pandora made 1.07 billion US dollars in advertising revenue. Pandora is an internet radio provider that was launched on July 21, 2005. It provides subscribers with music streaming and music recommendations based on user preferences. As of December 31, 2016, Pandora had 81 million active users. Since its launch, the company’s revenue has greatly increased. 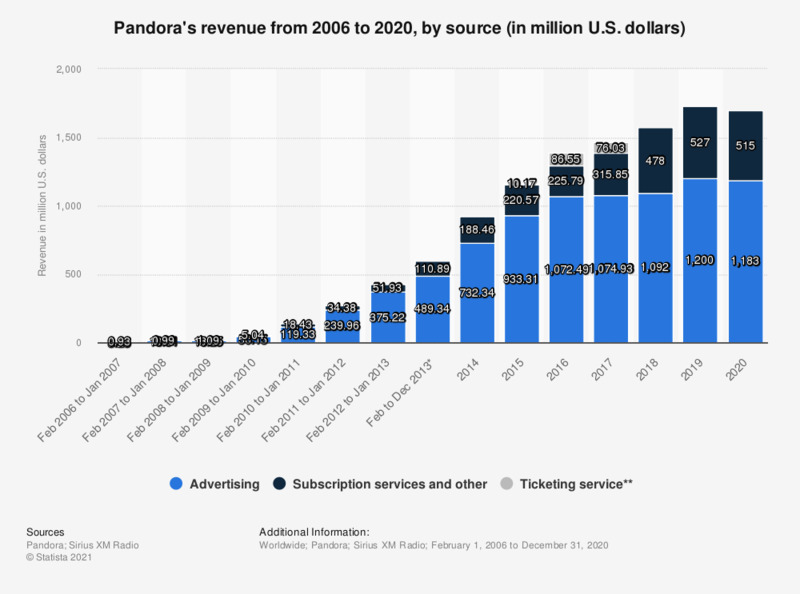 As of 2007, Pandora’s revenues from all sources totaled 4.18 million US dollars. By the completion of the fiscal year ending on December 31, 2016, Pandora had earned total annual revenues of 1.38 billion. Of that total, 1.07 billion U.S. dollars were generated through advertising sales alone, accounting for roughly 81 percent of revenues that year. Given that Pandora could count only an estimated 4.21 million paying subscribers in 2016 —most Pandora listeners make use of Pandora’s free music streaming services— it follows that subscription fees did not account for a greater share of revenue. In 2016 alone, Pandora radio reportedly paid 734.35 million U.S. dollars in royalty fees. * Transition period. Until January 2013, Pandora's fiscal year started in February and ended in January of the following year. Starting with January 2014, Pandora's fiscal year will start on January 1 and end on December 31 of the same year. ** Pandora provides the following information on ticketing service revenue for 2015: "Consists of two months of Ticketfly activity from the acquisition date of October 31, 2015 to December 31, 2015." Figures other than for 2016 and 2017 come from earlier financial releases. How often do you use Pandora (free)?